Friends pose for a photo as they prepare to break their fast on the beach, in the holy month of Ramadan, Rabat, Morocco, June 9, 2018. Here’s a look across the globe of Islam’s holiest month. After a month of fasting, Muslims from Kyrgyzstan to Tennessee, Dubai to Manchester are celebrating Eid al-Fitr and breaking their fasts. Since May 15, Muslims around the world have been observing Ramadan to commemorate the revelation of the first verses of the Quran to the Prophet Muhammad. For 30 days, worshippers have fasted during the day, eating only before sunrise and after sundown. Though breaking fast is celebrated nightly and with family throughout the fasting month, the last break, Eid al-Fitr, marks the beginning of a three-day celebration to signal the end of Islam’s holiest month. These photos show the breadth of the holiday. 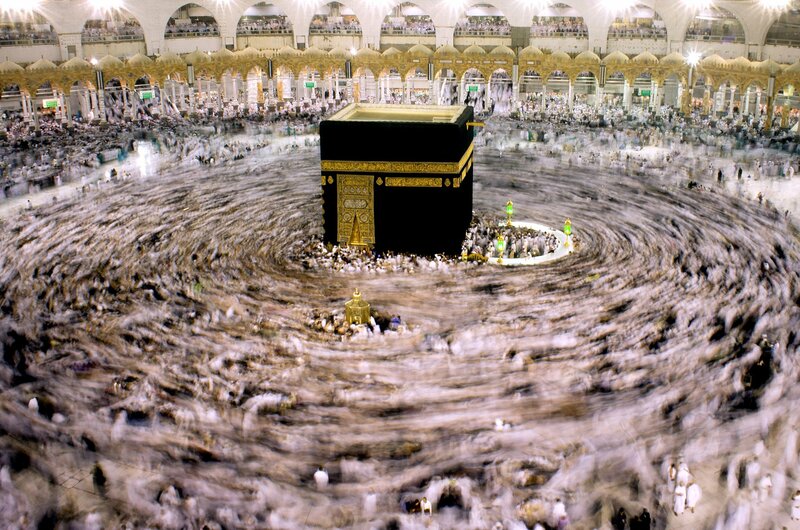 Saudi Arabia: In this picture taken with low shutter speed, Muslim pilgrims walk around the Kaaba, the cubic building at the Grand Mosque, during the minor pilgrimage, known as Umrah, marking Ramadan, the holiest month in the Islamic calendar, in the Muslim holy city of Mecca, Saudi Arabia, May 30, 2018. 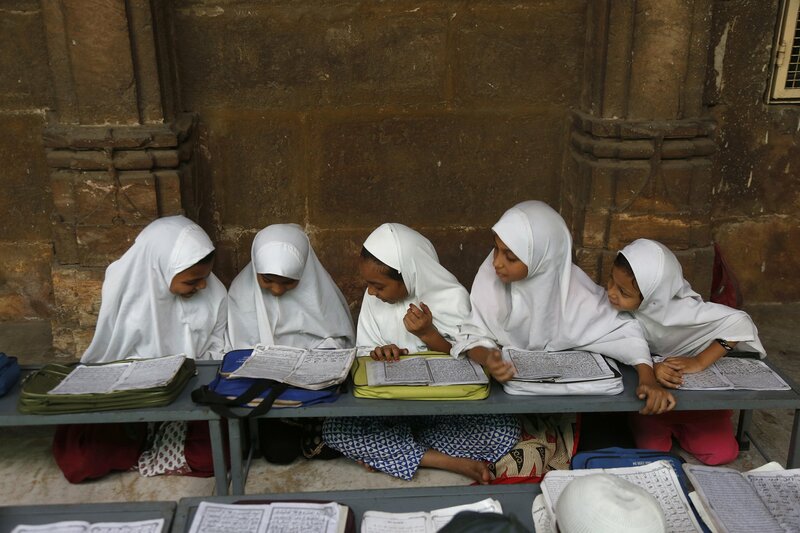 India: Indian Muslim children learn to read the Quran at Jama Masjid mosque on the first day of the holy Muslim month of Ramadan in Ahmadabad, India, May 17, 2018. 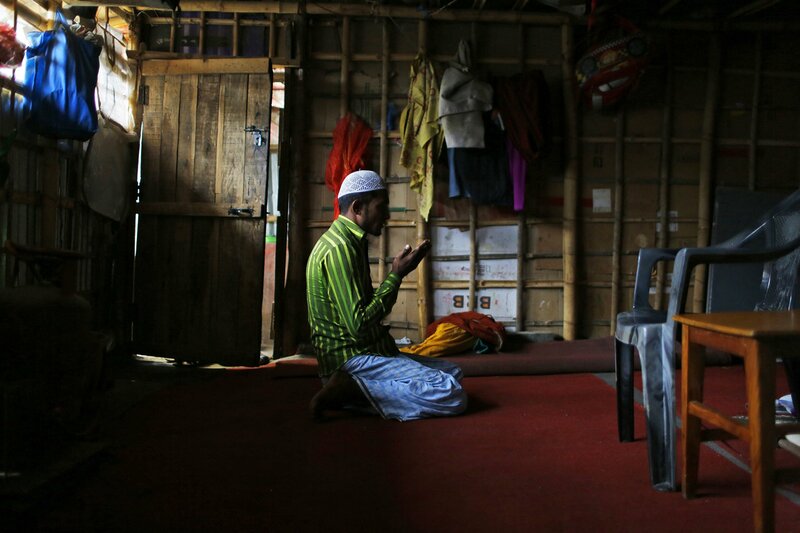 Nepal: A Rohingya Muslim man offers prayers at a refugee camp in Kathmandu, Nepal, May 18, 2018. 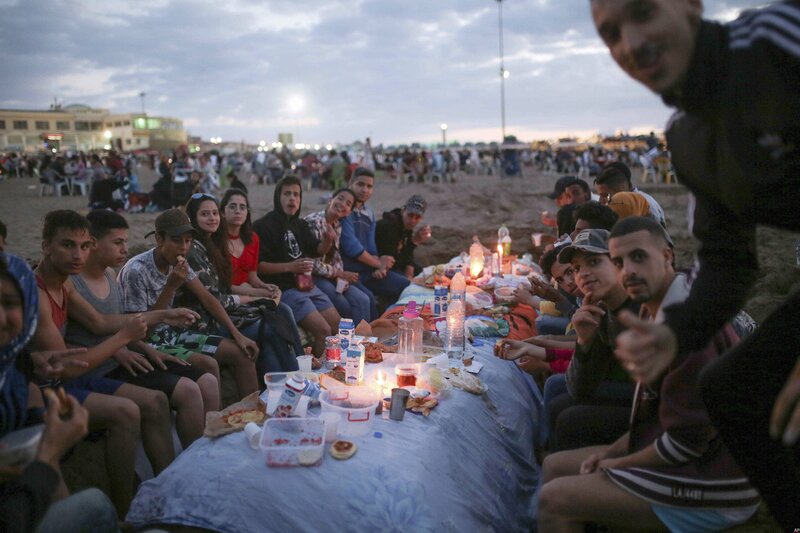 Morocco: Friends pose for a photo as they prepare to break their fast on the beach, in the holy month of Ramadan in Rabat, Morocco, June 9, 2018. Stocked with food and drinks, local families and friends swarm daily to the beach during Ramadan to enjoy the Atlantic breeze and take in the ocean view and, when the day’s fasting is declared over, share in the “iftar” meal. 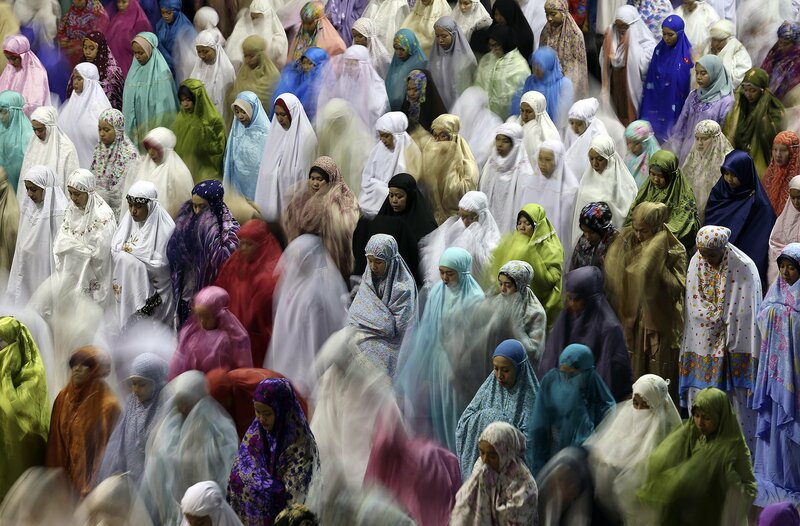 Indonesia: Muslim women perform an evening prayer called "tarawih" marking the first eve of the holy fasting month of Ramadan at Istiqlal Mosque in Jakarta, Indonesia, May 16, 2018. 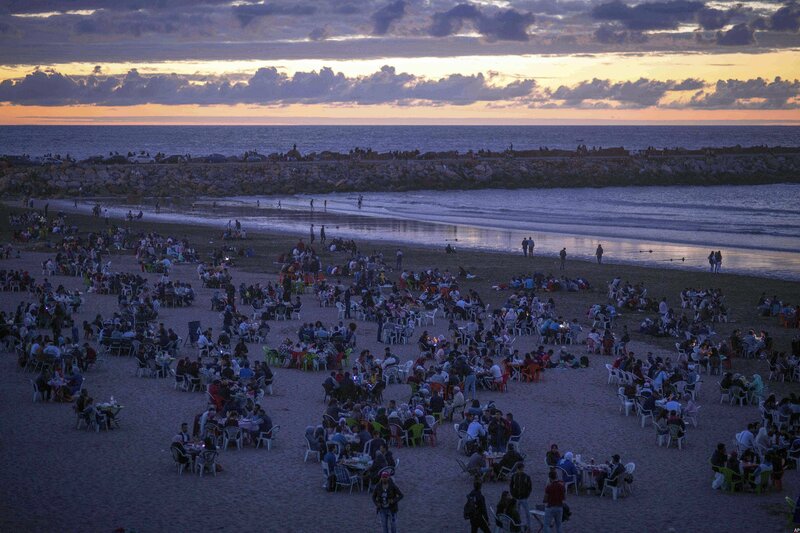 Morocco: Friends and families gather to break their fast on the beach in the holy month of Ramadan in Rabat, Morocco, June 9, 2018. Israel: A Palestinian Muslim worshipper prays outside the Dome of the Rock in the Al-Aqsa mosques compound in Jerusalem's Old City on Laylat al-Qadr which falls on the 27th day of the fasting month of Ramadan, June 11, 2018. Laylat al-Qadr, or Night of Destiny, marks the night Muslims believe the first verses of the Koran were revealed to the Prophet Mohammed through the archangel Gabriel. Indonesia: A Muslim woman has iftar on the first day of the holy month of Ramadan at the yard of Grand mosque on May 17, 2018 in Surabaya, Indonesia. Syria: Some 800 people break the Ramadan fast during an event organized by The Charity Foundation for the displaced people of Ghouta and the countryside of Homs — both in Syria — at the Great Archaeological Museum in the city of Maarat Al-Numan in the Idlib province on May 25, 2018. Indonesia: Muslims sleep in a mosque in Surabaya, East Java, on June 6, 2018, as part of their belief that God gives his blessing and mercy within the last 10 days of Ramadan. United States: Muslims gather at an iftar (fast-breaking) dinner in the street organized by Bergen Diyanet Mosque and Cultural Center during the holy month of Ramadan in Cliffside Park, New Jersey, on June 11, 2018. China: Women from the Hui Muslim community pray over food before breaking their fast during the holy fasting month of Ramadan at the Nanxiapo Mosque on June 8, 2018, in Beijing, China. Islam in China dates back to the 10th century as the legacy of Arab traders who ventured from the Middle East along the ancient Silk Road. Of an estimated 23 million Muslims in China, roughly half are Hui, who are ethnically Chinese and speak Mandarin. 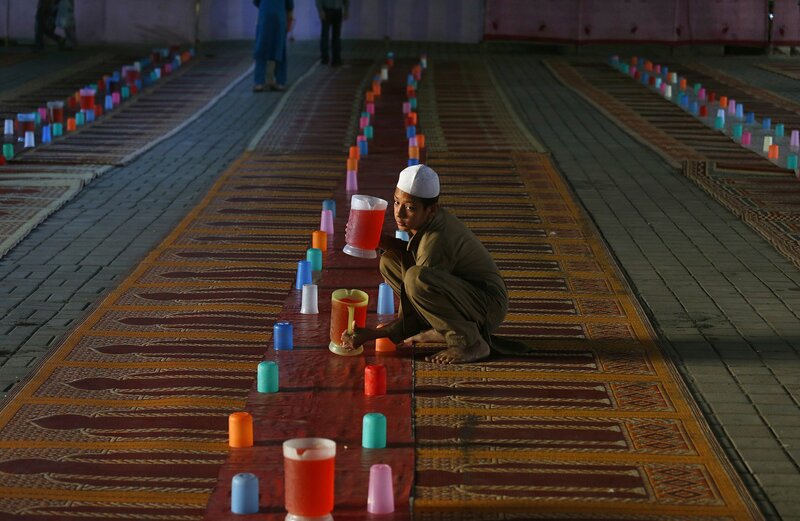 Pakistan: A boy sets out pitchers of juice for Muslims to break their fast during Ramadan at a free food distribution point in Rawalpindi, Pakistan, May 20, 2018. United States: A view of a mosque as Muslims arrive for the last Tarawih prayer of the holy Islamic month of Ramadan in Washington, DC, on June 13, 2018. 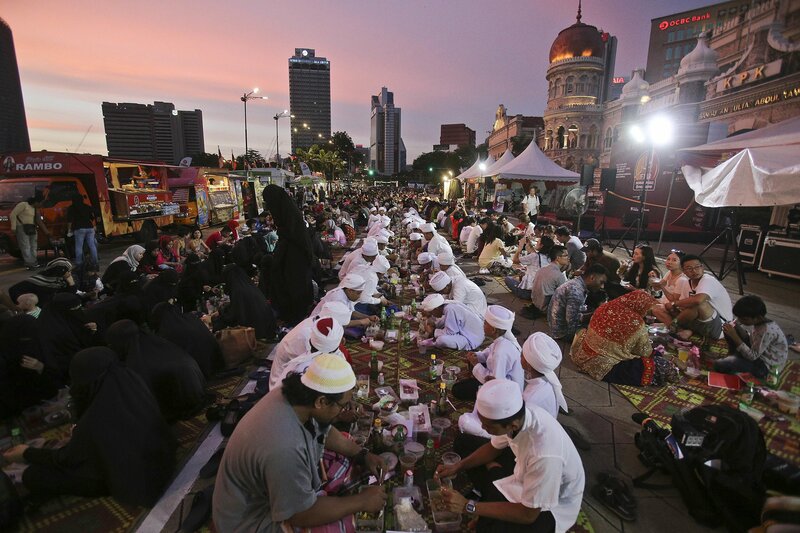 Malaysia: Muslim students break their fast during the holy Islamic month of Ramadan at Merdeka Square in Kuala Lumpur, Malaysia, June 3, 2018. Yemen: A man reads the Koran at the Grand Mosque during the holy month of Ramadan in Sanaa, Yemen, May 17, 2018. 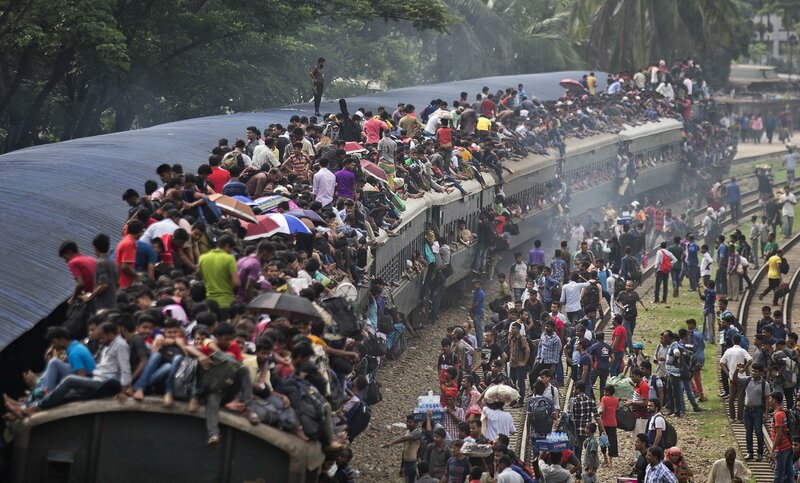 Bangladesh: Muslims maneuver their way on the roof of an overcrowded train to travel home for Eid al-Fitr celebrations, at a railway station in Dhaka, Bangladesh, June 14, 2018. Hundreds of thousands of people working in Dhaka are leaving for their hometowns to celebrate the upcoming Eid al-Fitr with their families. 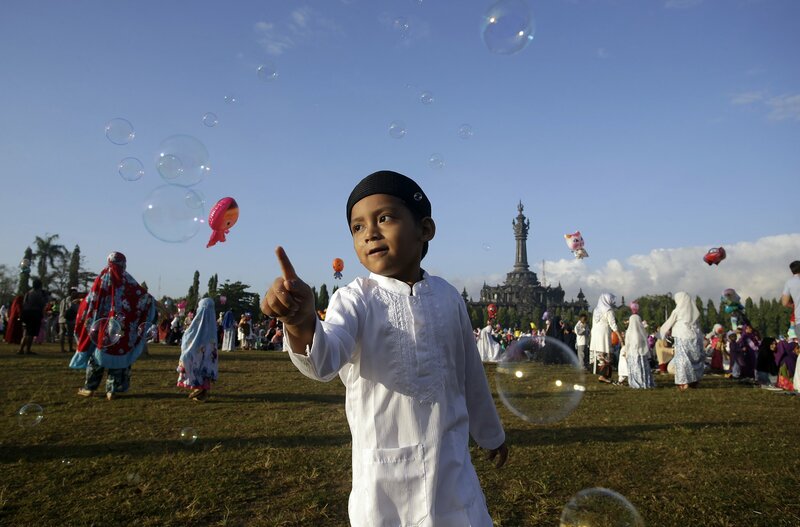 Indonesia: A Muslim boy plays with bubbles as he attends Eid al-Fitr prayers to mark the end of the holy fasting month of Ramadan in Bali, Indonesia, June 15. 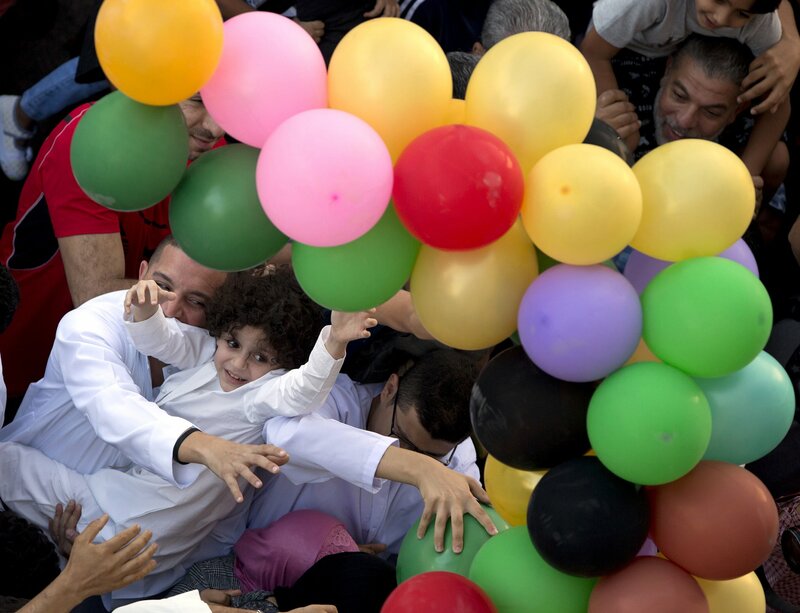 Egypt: Muslims try to catch balloons distributed for free after Eid al-Fitr prayers, marking the end of the Muslim holy fasting month of Ramadan outside al-Seddik mosque in Cairo, Egypt, June 15.